Also known as: USB extender, USB CAT5 UTP cable extension, USB booster, USB peripheral extender, USB active extension cable, extend USB device 165 feet via CAT5/5e/6/6a/7 network cable, 4-port USB hub extender system, USB balun, USB range extender. The XTENDEX® Low-Cost 4-Port USB 2.0 Extender extends four USB devices up to 165 feet (50 meters) using CAT5/5e/6/6a/7 cable. 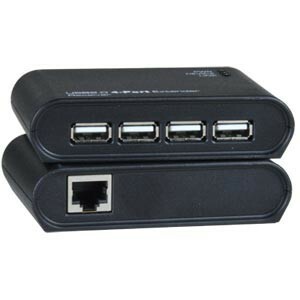 Each extender consists of a local unit that connects to a computer, and a remote unit that connects to four USB devices. The local and remote units are interconnected via CAT5/5e/6/6a/7 cable. Extend self-powered and/or bus-powered USB peripheral devices (security cameras, printers, scanners, keyboards, etc.). Extend up to 165 feet (50 meters) via a single CAT5/5e/6/6a/7 cable. Supports high-speed (480 Mbps), full-speed (12 Mbps), or low-speed (1.5 Mbps) USB devices. Must connect directly to a computer; will not work connected to a USB hub. Four female USB Type A connectors. Does not support USB hubs. Compatible with USB touch screen monitors, including HP Compaq L2105tm. The combined current consumption of the connected devices cannot exceed 1.5A. WxDxH: 3.75x2.68x0.92 in (95x68x23 mm). 165 feet (50 meters) over CAT5/5e/6/6a/7 cable. 0.5-meter male USB Type A to male USB Type B interface cable included. Use CAT5/5e/6/6a/7 UTP straight through cable for TIA/EIA-568B wiring terminated with standard RJ45 connectors (not included).